As dramatized in FX’s recently concluded and critically lauded The People v. O. J. Simpson: American Crime Story, the defendant evaded a double murder conviction after the jury bought claims that he had been railroaded by a bigoted Los Angeles Police department. The verdict came in October 1995. In October 1991, Thomas squared off against former Equal Employment Opportunity Commission employee and accuser Anita Hill before a Senate Judiciary Committee chaired by future vice president Joe Biden. The HBO film Confirmation (premiering Saturday, April 16th at 7 p.m. central) dramatizes the U.S. Supreme Court nominee’s successful refutation of her sexual harassment allegations. How so? He played the “race card” before a national television audience, most famously in a prepared statement that left both sides stunned. 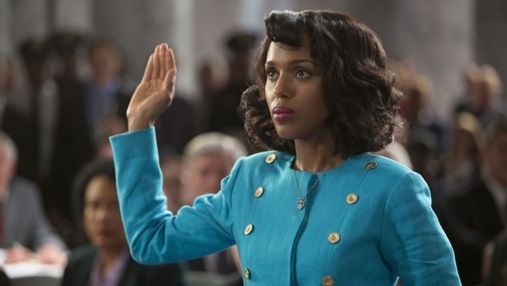 Never mind that Hill (Scandal star Kerry Washington) is also black. The “high-tech lynching” line, with old-line Southerners Strom Thurmond of South Carolina and Howell Heflin of Alabama among those on the judiciary committee, cut to the bone and took much of the starch out of the battle to keep Thomas from ascending to the U.S. Supreme Court as President George H.W. Bush’s second appointee during his four-year term. In a scene that speaks further volumes, Hill’s African-American attorney, Charles Ogletree (Jeffrey Wright), bluntly tells his client that none of the committee’s “white boys” will now be in the mood -- or of the political mind -- to further challenge the Thomas’ nomination. Liberal Democrats such as Biden, Ted Kennedy (largely neutered by his own sexual escapades) and Paul Simon certainly didn’t want to be seen as high-tech lynchers. Confirmation is an effective movie, although certainly not a great one, in terms of reconstructing how Hill was first persuaded to come forward and then left distraught, defeated and convinced it was “a mistake.” Washington and Pierce are both strong in these pivotal roles, particular in their recreations of testimony seen by millions on live television in another preview of what became the even more saturated coverage of the Simpson trial. Real-life network anchors and reporters, most of them now deceased or largely retired, are paraded through Confirmation in archival snippets from TV’s coverage and commentary. Former NBC Nightly News anchor Tom Brokaw is one of the more heavily used, telling his viewers near the end, “We have gone from shock to discomfort, now to a combination of anger, depression and shame” over the graphic details of Hill’s testimony and the seeming eagerness of some committee members -- most notably Biden -- to hear it repeated. Thomas’ Republican backers, if one can believe the movie, had Biden by the short hairs in terms of both altering the hearing schedule and, in the end, not allowing Angela Wright (Jennifer Hudson) to testify that she also had been sexually harassed by the Supreme Court nominee before being fired. “I also have an obligation to uphold the dignity and the credibility of the United States Senate,” Biden lamely laments at one point. “Yeah, how’s that goin’?” an elderly colleague shoots back. Biden is shown buckling and then backing down after stronger-willed Missouri Republican Sen. John Danforth (Bill Irwin) warns Biden to expect a “street fight” should Wright testify before the committee. Danforth assures him that if it comes to that, “I’m gonna pick up a crowbar.” The committee chair then caves. It’s all later rubbed in via a scene in which Biden nurses a toothache with a cold Coke can before popping it and taking a drink. Treat Williams as Ted Kennedy is largely a mute cardboard cutout. But in his only speaking part of any import, he musters an indirect defense of Hill after aide Ricki Seidman (Grace Gummer) basically shames him into it by telling her boss, ‘She’s all alone out there, sir.” Kennedy then gives one of those made-for-TV movie looks of consternation before rousing himself the next day. In the end, Thomas was confirmed on a 52-48 vote by a Senate with a 57-43 Democratic majority. Eleven Democrats, not including Biden, voted in favor of Thomas, who remains on the Supreme Court to this day. Although it doesn’t technically take sides, the film ends by noting that in the immediate aftermath of the Thomas-Hill hearings, sexual harassment charges against the Equal Employment Opportunities Commission doubled while the number of women elected to Congress was the largest in history. Confirmation connects most of the dots of those times while falling short of the dramatic impact left by FX’s O.J. Simpson miniseries. Those interested in playing a companion parlor game might want to see how many attendant TV anchors and reporters they recognize. As you’ll soon see, it was still very much a man’s world in that respect, too.